PU4-CU is manufactured with Polyester Polyurethane wall and an encapsulated copper coated steel wire helix. Minimum wall thickness from 0,35 mm to 0,50 mm. 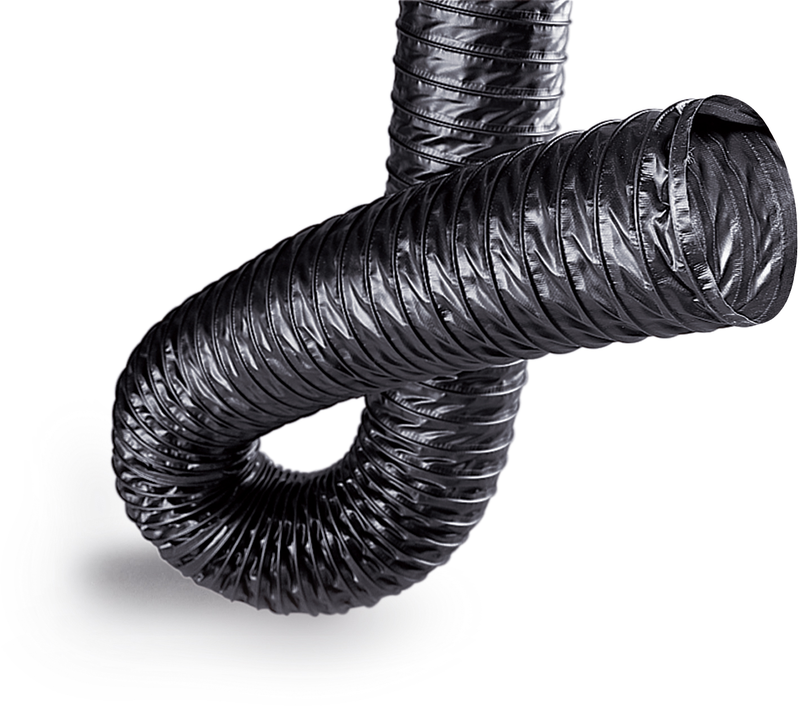 The use of polyurethane gives the hose an excellent tear and abrasion resistance and maintains both high flexibility and elasticity even at low temperatures. PU4-CU has excellent resistance to oils, fats, many solvents, and chemical agents. PU4-CU is also ozone resistant. Extraction and transportation of light solid materials. Suction of gasoline fumes and oils. Pneumatic conveyance of textile fibres, paper and plastic cuttings. Suitable for delivery of dry food conform to EU 10/2011. Conform to RoHs e REACH norms. PU4-ZN is manufactured with Polyester Polyurethane wall and an encapsulated copper zinc steel wire helix. 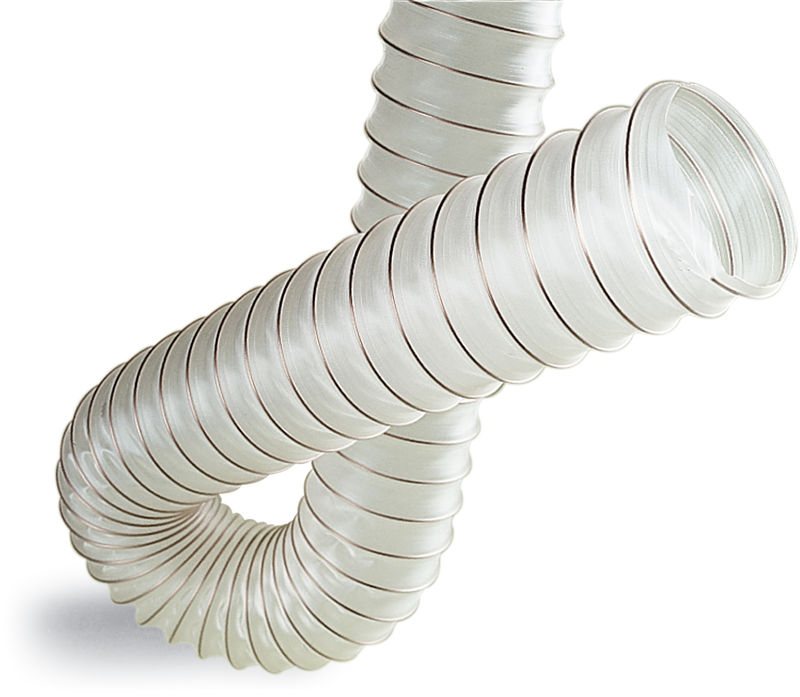 maintains both high flexibility and elasticity even at low temperatures. PU4-ZN has excellent resistance to oils, fats, many solvents, and chemical agents. PU4-ZN is also ozone resistant. 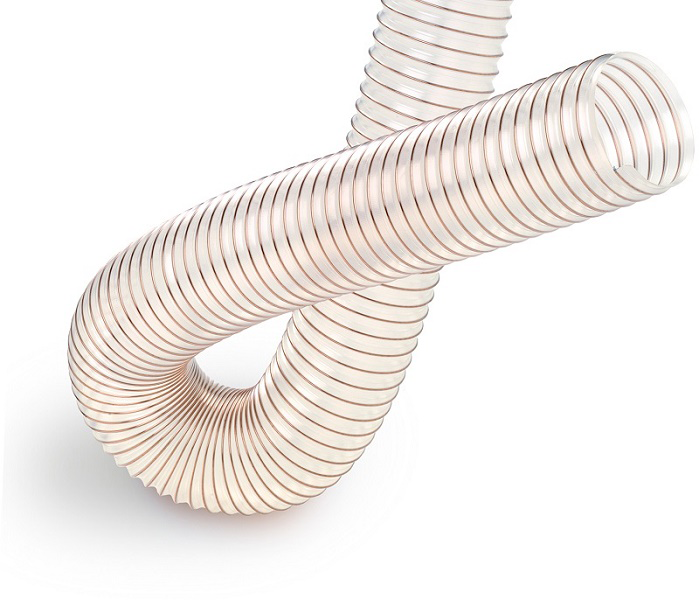 2PU hose is manufactured with high quality Polyester Polyurethane foil and a copper coated spring steel wire helix encapsulated between the PU layers. Minimum wall thickness from 0,35 mm to 0,45 mm. 2PU has excellent tear and abrasion resistance (seven greater than PVC). It maintains both high flexibilityand elasticity even at low temperatures. 2PU has excellent resistance to oils, fats, many solvents, and good chemical resistance. 2PUS hose is manufactured with high quality Polyester Polyurethane foil and a copper coated spring steel wire helix encapsulated between the PU layers. The use of the polyurethane profile and the narrow spiral pitch gives the hose excellent abrasion resistance and significant pressure and depression resistance. It maintains both high flexibility and elasticity even at low temperatures. 2PU-S has excellent resistance to oils, fats, many solvents, and good chemical resistance. Suction and transportation of air, dust and fumes. Gasoline fumes and oils extraction. Pneumatic transport of textile fibres, paper and plastic granules. Conveyance of light abrasive solids, for example ceramics industry. Conforme to RoHs e REACH norms. 2PULM hose is manufactured with thick Polyester Polyurethane foil and a copper coated spring steel wire helix encapsulated between the PU layers. Minimum wall thickness 0,50 mm. The use of a thicker polyurethane combined with a narrow pitch gives the hose an excellent wear characteristics and an increased resistance to pressure and vacuum. It maintains both high flexibility andelasticity even at low temperatures. 2PULM has excellent resistance to oils,fats, many solvents, and good chemical esistance. Extraction of wood shavings and sawdust. Suction of light solid materials. Pneumatic transport of textile fibres, paper and plastic cuttings. Ceramics industries – material transportation and handling. 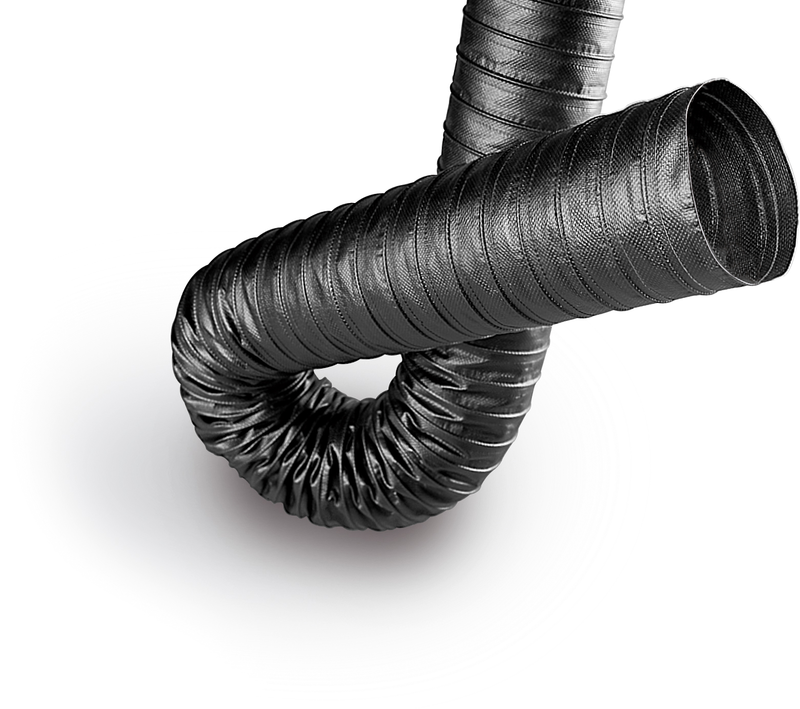 PU6-CU flexible hose has been realized with high quality Polyester Polyurethane wall supported by an encapsulated steel wire helix. Minimum wall thickness from 0,40 mm to 0,75 mm. 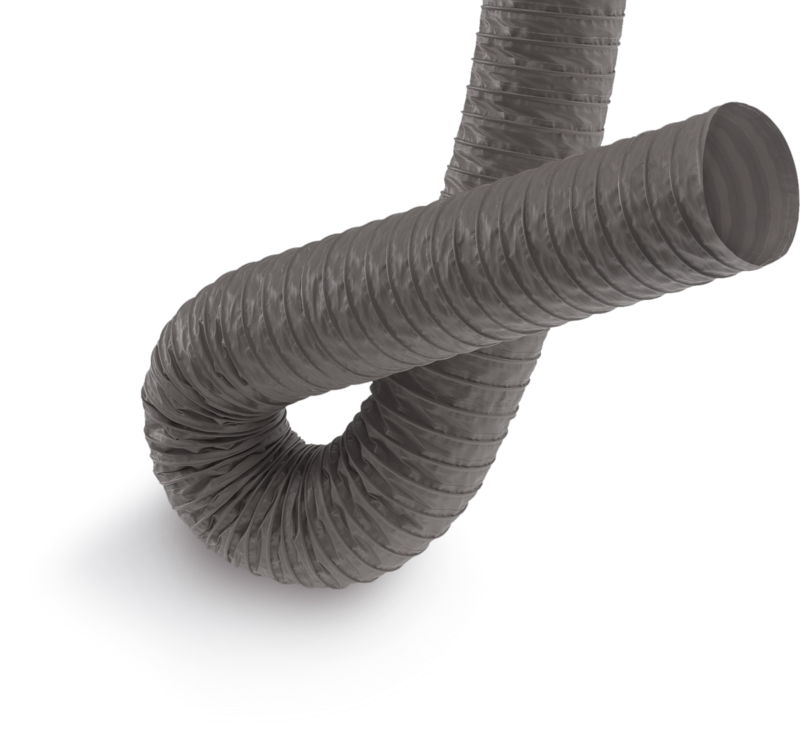 The use of polyurethane combined with a narrow pitch gives the hose an excellent abrasion resistance and an increased resistance to pressure and vacuum. 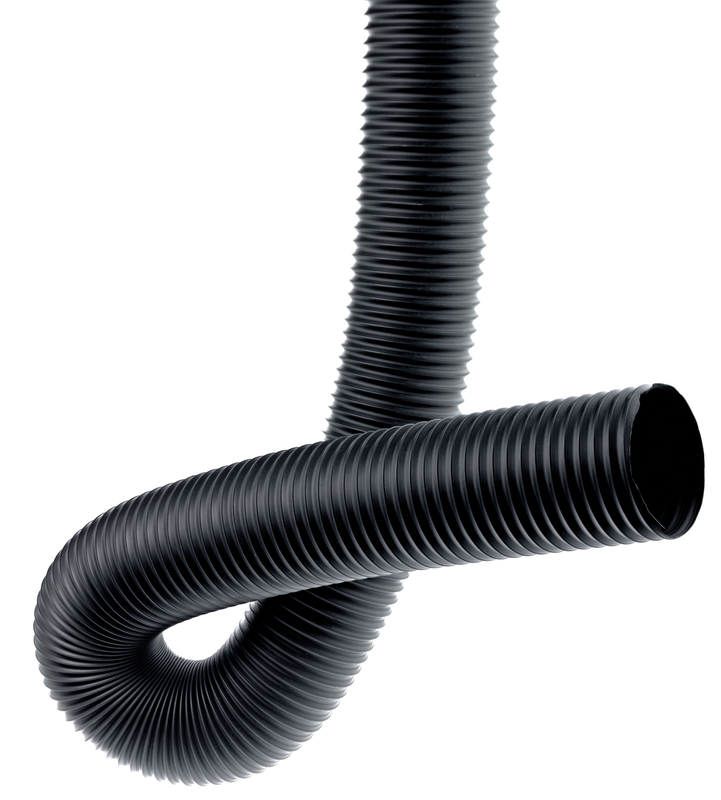 The hose maintains good flexibility even at low temperatures. PU6-CU has excellent resistance to oils, fats and many solvents as well as good resistance to chemical agents. PU6-CU is also ozone resistant. Suction and transportation of wood shavings and sawdust. Extraction and transportation of light solid materials. Suction of gasoline fumes and oils. encapsulated between the PU layers. Minimum wall thickness from 0,90 mm. an increased resistance to pressure and vacuum. fats, many solvents, and good chemical resistance. 2VP is constructed from self-extinguishing polyester fabric coated on both sides with polyutrethane and an encapsulated phosphate coated steel wire helix. 2VP is both flexible and lightweight whilst being robust due to its fabric re-enforcement. Additionally 2VP has excellent resistance in high temperature ambient environments and has good insulation characteristics. It is recommended where self‑extinguishing properties are required. Gas and fume extraction and conveyance. Suction in the presence of high temperatures. Air suction and conditioning in marine, civil and industrial areas. Extraction and transportation of light dust particles. 2SP is constructed from polyester fabric coated on both sides with a thermoplastic elastomer PP/EPDM – Santoprene® supported by an embedded and phosphate coated steel wirehelix. The hose has very a good mechanical resistance even at extreme temperatures, maintaining very high levels of flexibility, particularly at low temperatures. Additionally, 2SP has excellent chemical resistance to both acids and solvents fumes, as well as having a good ozone and UV resistance. Suction of fumes in chemical plants in the presence of acids and solvents. Suction and conditioning of air in naval, civil and industrial areas. Utilization with UV rays exposure. 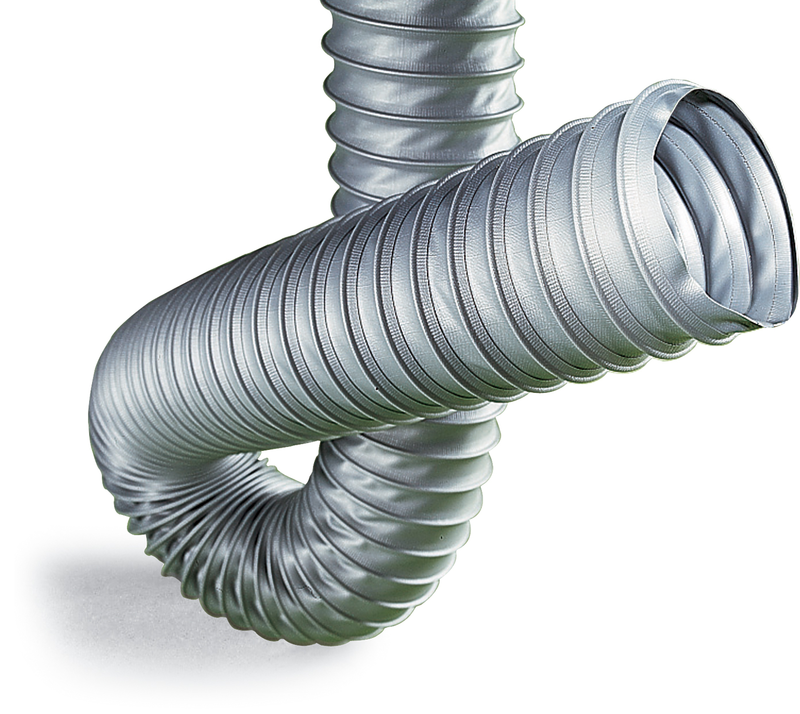 2SPIG is manufactured from a heavyweight (20% more than P2SP) polyester fabric coated on both sides with a thermoplastic elastomer PP/EPDM – Santoprene® self-extinguishing supported by an embedded phosphate coated spring steel wire helix. 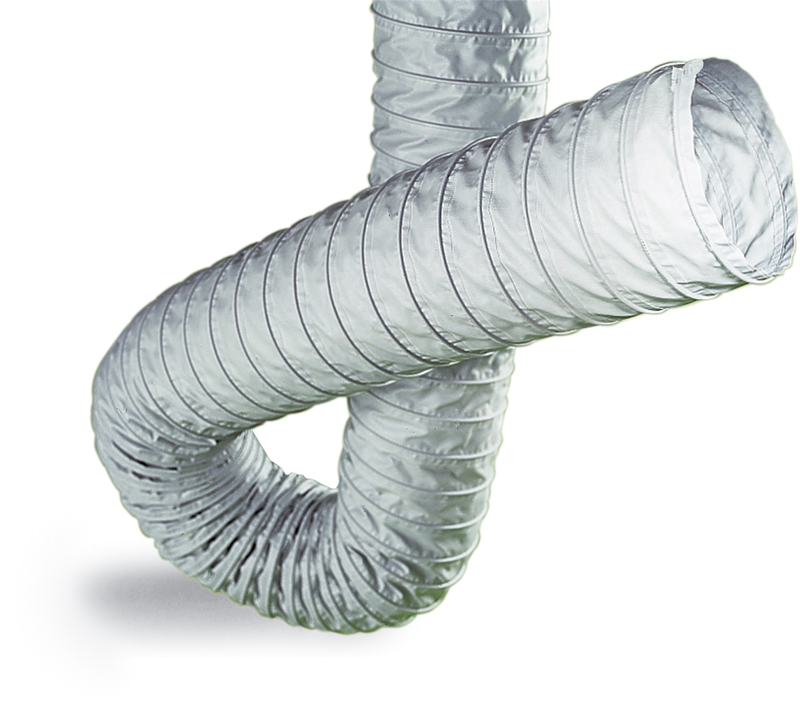 The utilization of this special fabric gives the hose excellent mechanical resistance even at extreme temperatures, and allows the hose to maintain maximum flexibility at low temperatures. Additionally 2SPIG is self-extinguishing and is suitable for use where excellent chemical, ozone and Uv resistance is required. Air and fume extraction in high temperatures environments. Air extraction and conveyance in naval, civil and industrial areas. Air and fume extraction in flammable environments. TPR6 is made from a vulcanized thermoplastic soft rubber film basis EPDM and an encapsulated phosphate coated spring steel wire helix. Additionally, TPR6 is notable for its excellent chemical resistance to acid and alkali fumes, alcohols, detergents and solvents, as well as its good ozone and UV resistance. Elevated thermal and electrical insulation properties. Utilization with UV` rays exposure. BN-6 OIL is constructed from a PVC-BUNA wall and an encapsulated phosphate coated spring steel wire helix. Minimum wall thickness: from 0,43 to 0,65 mm. 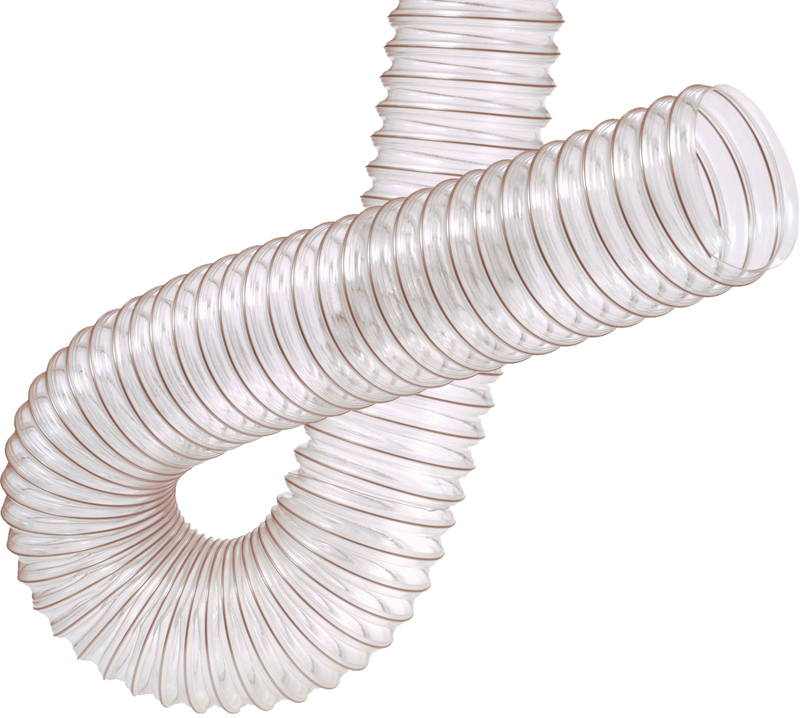 The use of PVC / BUNA leaf gives the tubing excellent oil resistance while maintaining excellent flexibility and elasticity and excellent axial compressibility. Additionally, BN-6 OIL has excellent resistance to fats, many solvents, and chemical agents. Suction of gasoline and mineral oil fumes. Suction of vapors containing emulsified oils. 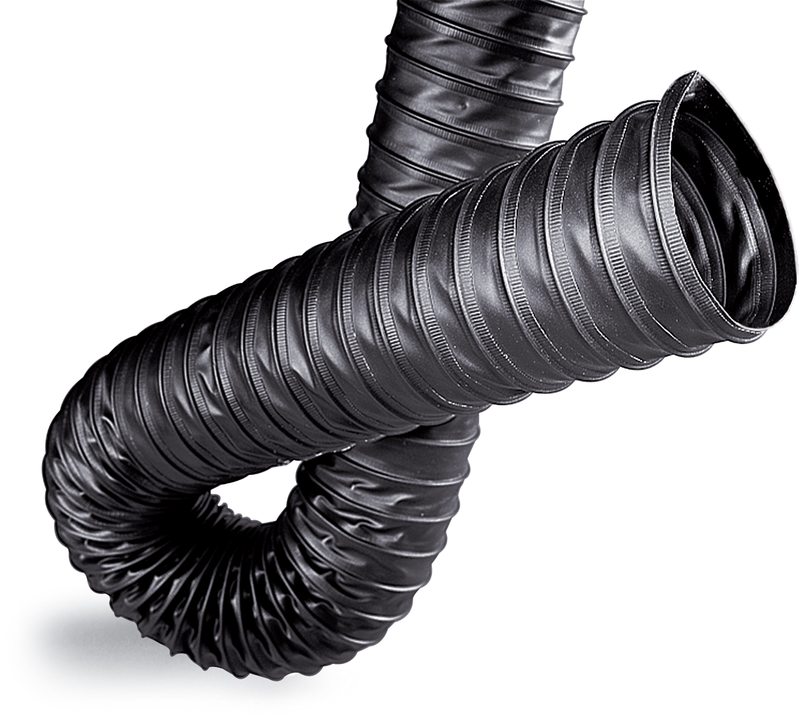 2NK flexible hose is constructed from self-extinguishing PVC coated on both sides lightweight polyester fabric supported by an embedded phosphate coated spring steel wire helix. 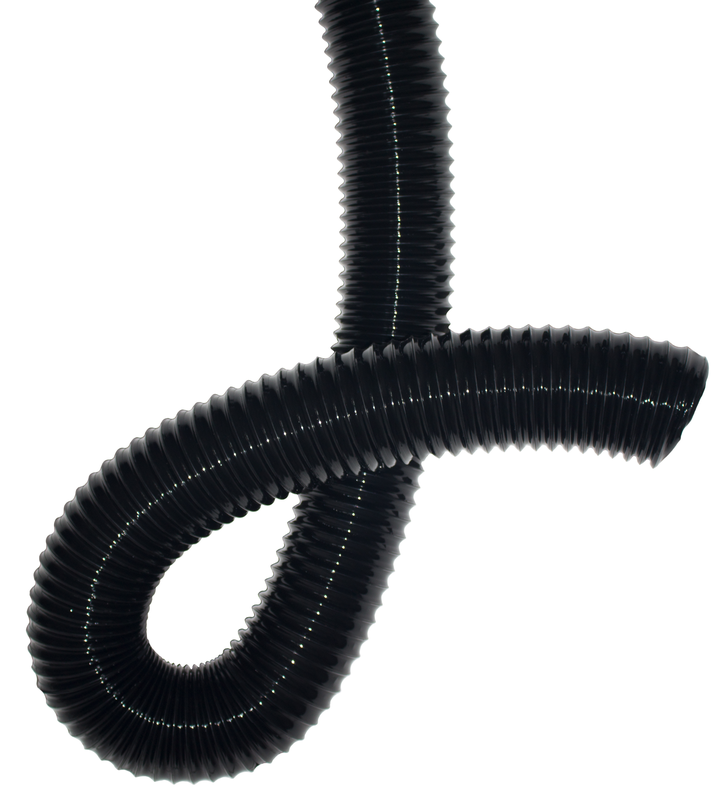 The hose is both very light and highly flexible whilst being robust and has excellent axial compression values. 2NK is suitable for dynamic applications, thanks to its good mechanical resistance. It is recommended for applications where a cost-effective and self-extinguishing hose is required. Extraction of gases and fumes. Dynamic application, for example on mechanical arms. 2 CL self-extinguishing PVC coated on both sides glass fibre fabric supported by an encapsulated PVC coated spring steel wire helix. Additionally, 2CL has excellent temperature resistance. It is particularly suitable in applications where self-extinguishing properties are required. Air handling in high temperature environments. 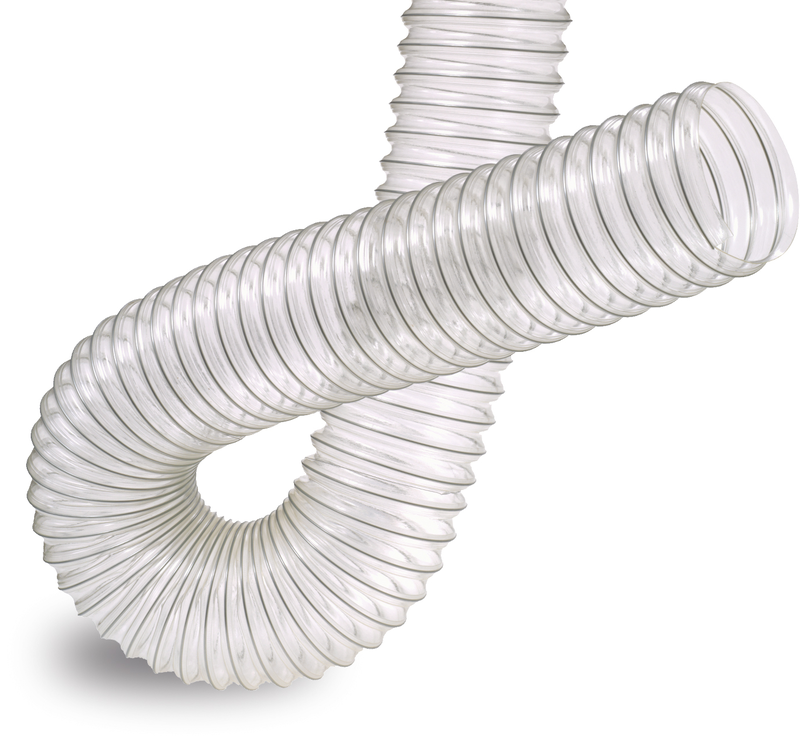 2GEN is manufactured from a soft self-extinguishing PVC wall and an encapsulated phosphate coated spring steel wire helix. By using unreinforced PVC, this hose achieves optimum lightness and flexibility, giving it high axial compression that make it very suitable for dynamic applications. Additionally, 2GEN has good chemical resistance, and gases is also gas and watertight. It is recommended for applications where self-extinguishing properties are required. Steam and chemical vapour extraction. Transportation of low pressure fluids. 2HL has been realized with antistatic PVC coated on bth sides strong polyester textile and an armonic steel wire helix, coated with phosphates, embodied into the textile layers. The anti-static fabric is conductive, makingthe hose suitable for use in areas where there is a risk of deflagration or fire. Due to its smooth construction 2HL is less likely to exhibit electrostatic charge build up. 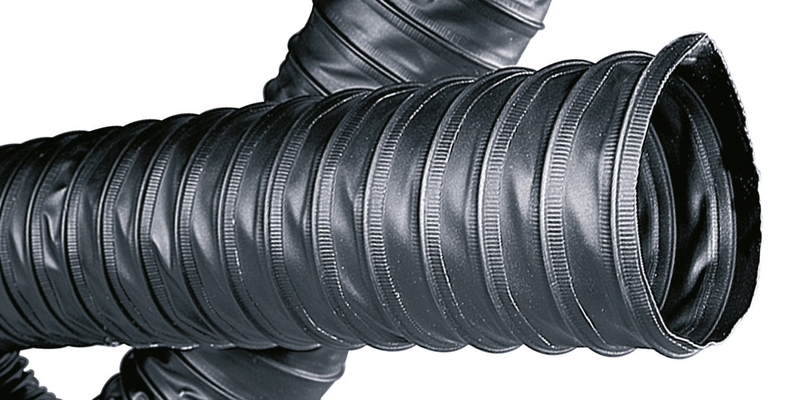 The hose has excellent tear and wear resistance. Materials and powder handling, dust and fume extraction of electrostatically charged media. Suction in areas where there is a high risk of fire for example paper industries. Suction in areas with a risk of deflagration, such as chemical and oil facilities.